My two-year-old daughter? She’s just like me. Oh sure, she’s got her own unique personality. She’s fun and spunky and sassy and creative and silly and dramatic all in her own way. But she also yells out, “COOKIE!” from the back seat of the car as soon as we drive past the big red bullseye on the Target sign, anticipating the free treat given to her from the bakery counter every time we shop there. Her arms swing up and down in delight at the sight — the mere mention — of ice cream. She’s been asking for a doughnut after breakfast, after lunch and after dinner since last Saturday, when she received one on a special occasion (OK, and the Saturday before that, too). She’s got so much of her own character, and some of her dad’s, too, but that sweet tooth? I take full credit/blame for that. 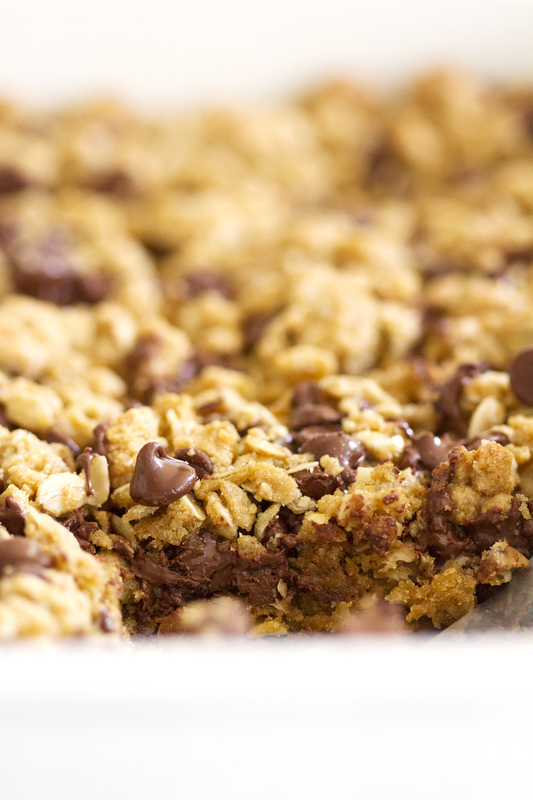 Second only to my love of the chocolate chip cookie is my love of the oatmeal chocolate chip cookie, and in bar form, when they are even softer and chewier and chocolatey-er, my sweet tooth is full-on swooning. I’ve made these before with regular flour and they are obviously delicious, but this time, when my summer figure (LOLZ) requested a little bit of virtue, I thought I’d give them a try with white whole wheat flour, which offers the nutritional benefits of wheat flour but without the sometimes-harsh taste (The Kitchn does a great job of explaining more about it here). It’s my go-to flour when I want a healthier halo on my baked goods without having to sacrifice their texture of flavor. As I suspected, white whole wheat flour works beautifully in these oatmeal chocolate chip cookie bars, and I daresay it makes them even more tender than they are with all-purpose flour. Of course, I didn’t spend too much time thinking about it, because I was too busy oohing and ahhing over the melty chocolate speckled throughout each bar and the sprinkle of sea salt on top that brings them to that next-level of yum. I may also have been too busy eating one, too, while wondering how I was going to sneak another one past Avery. She’s as cunning as I am when it comes to swiping things when no one is looking. The original batch of these bars is already near its end, and I can only imagine the horror that will ensue when any of us goes to grab the last one and there’s nothing to grab. Good thing these are so easy to make (one bowl, you guys! My fave). Crisis averted. Big and little sweet tooths satisfied. Summer figures saved (mostly). Heat oven to 350 degrees F. Spray bottom and sides of 9-by-13-inch pan with cooking spray. In large bowl, stir oats, flour, brown sugar, baking soda and salt to combine. Stir in melted butter, eggs and vanilla until dough forms. Stir in 1 cup chocolate chips. Spread and press half of dough in even layer into bottom of prepared pan. Top with another 1/4 cup chocolate chips. Crumble remaining dough over top, press down slightly. Top with remaining 1/4 cup chocolate chips. Bake 25 to 30 minutes until golden brown. Sprinkle a pinch or two of sea salt over top just after baking, if desired. Cool completely in pan before cutting into bars, about 1 hour. It’s difficult to go a day without chocolate, isn’t it! Loved reading Avery’s “cookie” reaction! These look like the perfect snack! 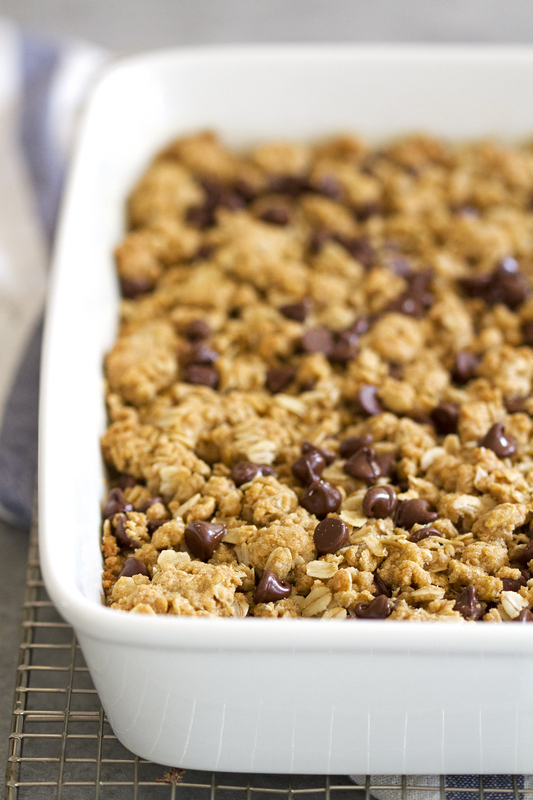 There’s something about an oatmeal and chocolate bar of any kind that always gets me excited to bake! Because it is mostly oatmeal, does it mean that this is great for breakfast with coffee or tea? I like the white whole wheat flour aspect and look forward to making this for us. Thanks again for a doable recipe. 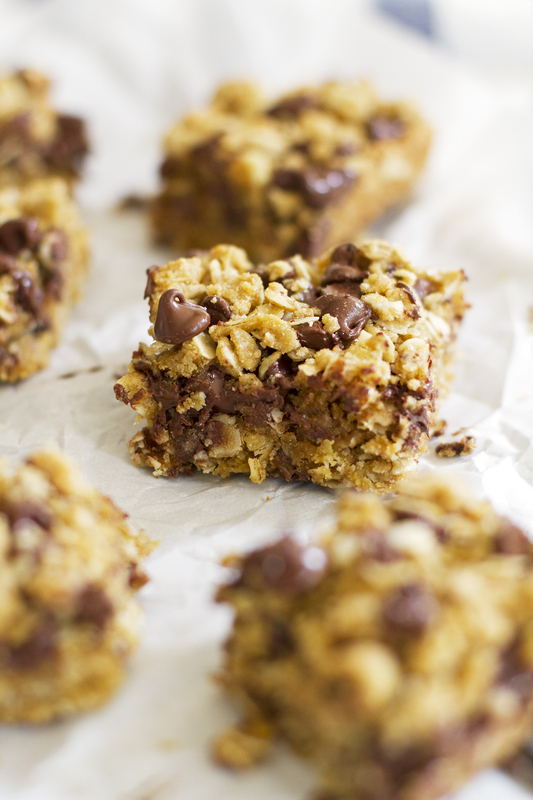 Oatmeal chocolate chip cookies are my favorite, especially when I can make them in bar form! These would disappear in a hurry at our house! Elaine — Dare I say it’s impossible? 😉 Thanks! Abby — Ha ha, and our stash for sanity includes chocolate and Doritos, because we keep it real classy around here. 😉 Thanks, love! Katrina — Me too! Thanks, girl! Karen — I think that makes it count as breakfast, for sure! 🙂 Thank you! 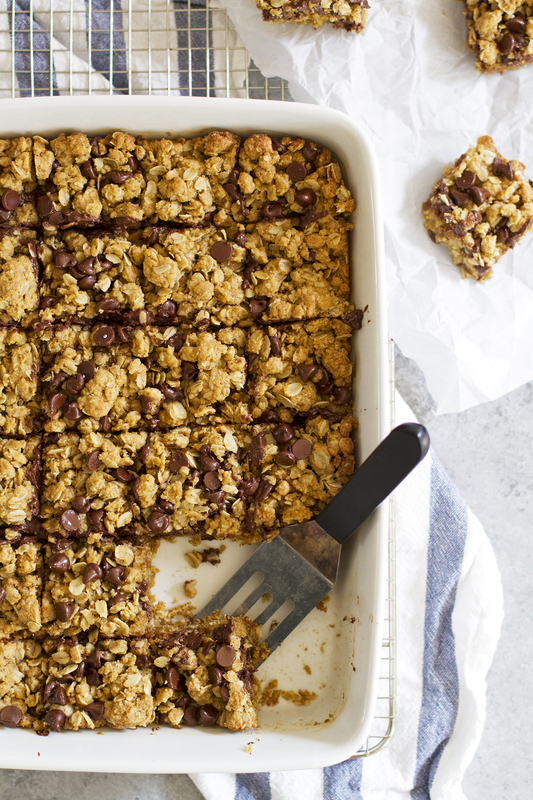 I’ve been craving *all* the cookies lately, these bars are just what I need! lol awwwwwww your lil sweet toothed nugget! She’s a smart one, like her mama 😉 And ooohhhh yes these bars look so perfectly chewwwwy and delicious! theese look awesome!!! do you have nutririon facts?